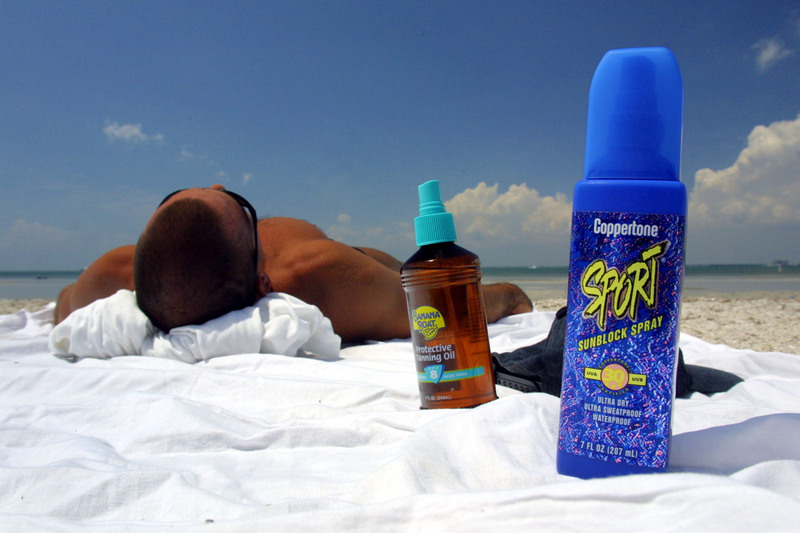 Your sunscreen may be protecting you from those harsh U.V. rays, but watch out — it might just burn you. No, literally. The FDA has issued a warning over a certain type of combustible sunscreen, after several people caught fire using it. So far, five incidents have been reported in which people using this type of spray sunscreen had to be hospitalized for the severity of their burns. Apparently, even when the spray is applied hours earlier and feels completely dry on the skin, it still has the potential to catch fire. Luckily, people are never around open fires during the summer. Oh...wait. "The ignition sources were varied and involved lighting a cigarette, standing too close to a lit citronella candle, approaching a grill, and in one case, doing some welding," the FDA notice said. "These incidents suggest that there is a possibility of catching fire if you are near an open flame or a spark after spraying on a flammable sunscreen." Although the various types of sunscreen responsible for each accident have since been taken off the shelves, it's obviously impossible to tell how many people have already bought the lotions, not to mention how many other dangerous sunscreens may be out there. Personally, I'm taking it as a sign to stay in and follow the #royalbaby.